Lung Foundation Australia has developed a suite of evidence-based resources to support health professionals in timely identification and management of COPD exacerbations. To help raise awareness amongst your patients and how to manage an exacerbation, visit Lung Foundation Australia’s website, where you can access a range of education and awareness resources. 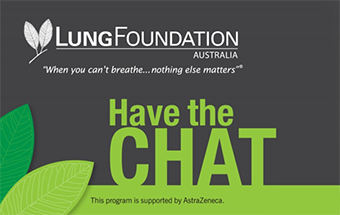 Lung Foundation Australia’s Have the CHAT campaign is supported by AstraZeneca. i. National Health Performance Authority 2015, Healthy Communities: Potentially preventable hospitalisations in 2013–14. ii. Halpin D. Mortality in COPD: Inevitable or Preventable? Insights from the Cardiovascular Arena. COPD: Journal of Chronic Obstructive Pulmonary Disease 2008. 5:3, 187–200.